The ability to quickly export your MIDI compositions by dragging and dropping is now available for Liquid Music VST and AU. There is a new button in the toolbar at the top of the screen that looks like a square with a ‘plus’ in the middle of it. Simply clicking and dragging this button into your DAW will instantly export all the notes in your Liquid Music arrangement, directly into your DAW’s project. You can also do the same drag and drop onto your computer’s desktop to export as a MIDI file. This workflow will boost the brainstorming and composition process when you use Liquid Music VST and AU. We hope you love it, and do let us know if you feel it’s missing a feature. By the way, if you simply click on the MIDI Export drag-n-drop button, a pop-up menu appears with some options for customizing your MIDI export. 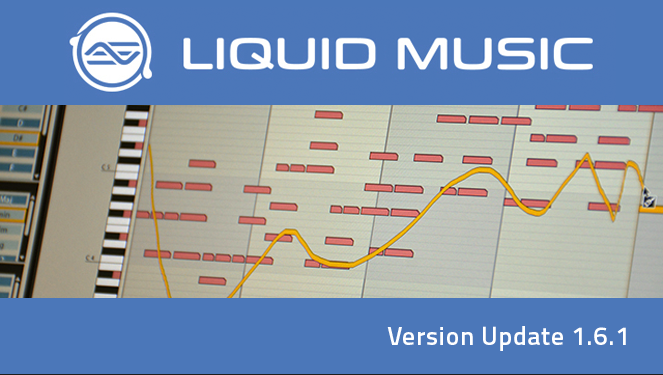 The list below summarizes the new features, workflow improvements, and bug fixes included in the latest version of Liquid Music. Easily export MIDI from Liquid Music VST and AU. Click on the MIDI Export button in the toolbar, and drag-n-drop into your DAW, to create an exported clip with MIDI notes from Liquid Music. Alternatively, dragging and dropping from the button into Explorer / Finder will create a MIDI file at that location on your hard drive. Fixed an issue where the “Scramble” options in the drop down menu in the Arpeggiator panel did not affect the Scramble button’s behaviour. Fixed an issue where setting the Offset knob in the Arpeggiator to “S”-mode could cause an error in certain combinations of settings. Fixed an issue where MIDI mapping a hardware controller in Liquid Music, saving a Live project, and then reloading the Live project, can cause a crash to occur. Fixed the Arpeggiator’s “Knob Targeting Controls” bug where changing the controls would either not immediately update the knobs on the screen or update them but draw them incorrectly on-screen. Fixed the following issue: When the Harmony Builder panel is open, and you open BB / BW / Maps (from the buttons in the toolbar on the top-right), the HB button stayed activated, even though it might have been automatically closed. It now deactivates appropriately. Fixed scrollbar speed: Some scrollbars were painfully slow for some panels. Now they respond much quicker. Fixed numerous issues that would cause errors when attempting to load MIDI maps, or when closing Liquid Music while a MIDI Map was loaded. Fixed an issue that would cause an error to occur when deleting a MIDI map. Fixed an error that would occur when changing the Sketch’s colour while in Rhythm Tools mode. Fixed a compatibility issue with the Lemur MIDI script and Liquid Music’s Harmony Tools mode. Under certain circumstances, fixed errors that could occur when selecting “Arranger” from the “View” menu. Removed an internal error message and replaced it with a more informative error message when saving a Master Preset that was not of an accepted size (i.e. 2, 4, 8, 12, or 16 bars). Fixed multiple errors that could occur when viewing and adjusting Harmony-specific settings (in Preferences) while in Rhythm Tools mode. Fixed an error that could occur when using the MIDI Importer on an empty clip. Fixed an issue that would cause the options in the View menu to be enabled and accessible even though a clip was not selected in Live. Some of those options could cause errors in this state. Improved future compatibility for Mac OS Sierra. Clicking on the “website” link in the “About” window can cause an error to occur on some versions of OSX Yosemite. Dragging and dropping a BeatForm from the Molecule Tool’s BeatForm Pallette into the Rhythm track (in ‘Harmony Tools’ mode) can cause notes to be generated at the bottom-most MIDI note (C-2). Some reports have been submitted about failure to use Liquid Music with the Lemur MIDI script for Liquid Rhythm. We are working on an AAX implementation of the new Liquid Music and Liquid Rhythm plugins for OSX and Windows. Opening the Mixer and then loading a Loop from the Library will cause an error. Using the Mixer can sometimes be a little glitchy. Liquid Rhythm is not RTAS compatible.